I am not used to making my own Belén, that is, to buy holy figures to recreate Bethlehem Nativity Scene. But I do enjoy watching those religious items displayed inside Christmas stalls set during Fira de Santa Llucia each year in Barcelona. Check similar posts: Holy Scenes. is this the only time of year these figures are for sale in the markets? I used to live in Europe (Krakow, PL) and there was this amazing holiday market on the main city square. They were selling similar figures! I loved to go there just to browse..
- No Deborah, there are shops selling them all year long, but the stalls are set only on these occasions. Normally tourists are the only ones to buy caganers off season as souvenirs. 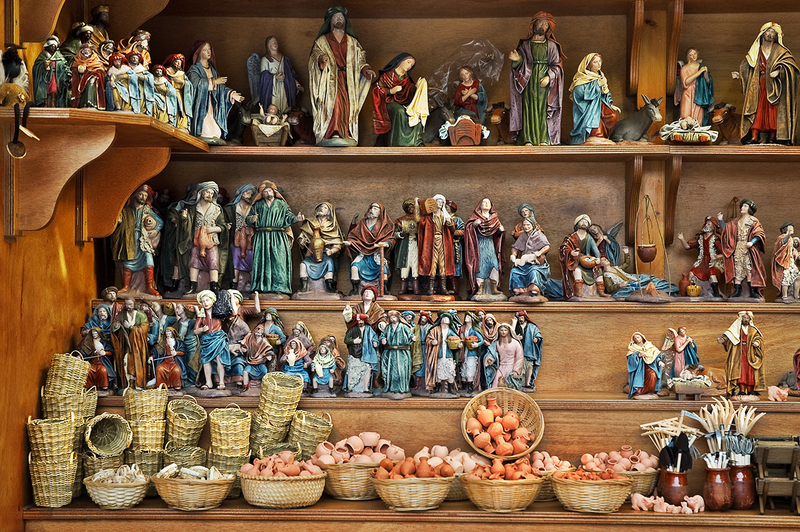 Locals buy mainly the classic one, the peasant, for the nativity scene. -Glad that you liked it Joanna. Thanks for coming. Do you know any website where we can buy these Spanish Belenes? And do you have any idea how much they usually cost? No idea about the cost (open from October to January only. I don't know any other either.